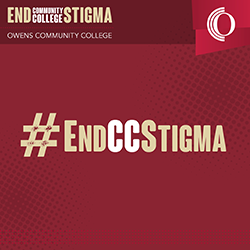 No outside individual or entity may use the Owens Community College logo without written permission from Owens Community College. For more information, contact the Office of Marketing and Communications at (567) 661-7114. View our Brand Guidelines for instructions on how to properly use the Owens logo. Right-click the link and select Save Target As or Save Link As. When a message box appears, choose your file location and click Save. Make note of where you save the file. For general web or digital use, please use JPG files. For media or professional printer use, please use EPS or Adobe Illustrator files (you will need appropriate graphic art software to open these files).